Don’t alert the Pride, but Hulu has renewed Marvel’s Runaways TV show for a second season of 13 episodes*. The season one finale, episode 1.10, “Hostile,” will debut on Hulu tomorrow, January 9th, and the cast will live tweet it at 9:00pm ET/6:00pm PT. The Marvel’s Runaways season two release date is still TBD. When we know more, you will, too. 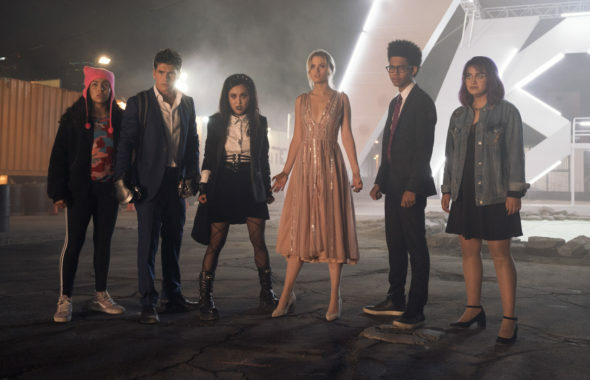 A superhero drama, streaming on the Hulu paid subscription platform, Marvel’s Runaways stars Rhenzy Feliz, Ariela Barer, Lyrica Okano, Gregg Sulkin, Virginia Gardner, Allegra Acosta, Julian McMahon, Ryan Sands, Angel Parker, Brittany Ishibashi, James Yaegashi, Kevin Weisman, Brigid Brannagh, Annie Wersching, Kip Pardue, James Marsters, and Ever Carradine. It follows six unusually gifted Los Angeles teens who discover their parents share a sinister secret. Learn more about the Marvel’s Runaways TV show renewal from this Marvel press release. Don’t miss the season one finale of the series Tuesday, January 9 only on Hulu! Fantastic news — our Runaways will return for a second season on Hulu! Don’t miss the Season 1 finale this Tuesday, January 9, on Hulu! Be sure to follow @Runaways on Twitter and like the official “Marvel’s Runaways” Facebook page! *NOTE: Although the release doesn’t specify an episode count for season two, Deadline reports the renewal is for 13 episodes, whereas season one will wrap up tomorrow, with episode 10. What do you think? Are you a fan of Marvel’s Runaways TV series? Do you plan to stream season two on Hulu? Love Marvel’s Runaways: fun, interesting and engaging. Love the young characters. Marvel is hitting it out of the park with all their new shows. Young fresh faces this is what we need. I was getting tired of the same old same old farts that keep trying to reinvent themselves–they need to retire. Marvel’s keep it coming … I want to see more story ideas.